Happy Holidays! Next week is Thanksgiving. We were hiking every day with our poles on the dunes, trails, and 2-tracks here in the Sleeping Bear Dunes National Lakeshore. Last week it started to snow and we have been Nordic Skiing (cross country skiing) every day since. 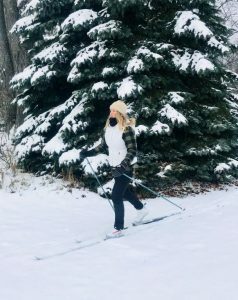 Nordic Walking and Nordic Skiing are kissing cousins. Both are awesome and both provide a better workout than just regular walking. We use SWIX and EXEL Poles when we hike, roller ski and cross country ski. Why? Because they are quality one-piece poles custom fit to our heights. Our walking and ski poles are almost identical. Both have durable and user-friendly one-piece shafts. Both have comfortable and patented Salomon patented straps – real Nordic straps. SWIX and EXEL walking poles are strong enough for athletes and dependable enough for seniors and individuals with balance issues. 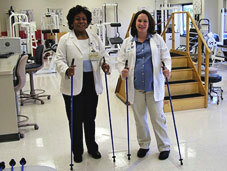 Here at SKIWALKING.COM LLC and the American Nordic Walking System, we recommend quality one-piece poles. You can’t roller ski or cross country ski with collapsible poles – collapsible poles are too cheap and flimsy. 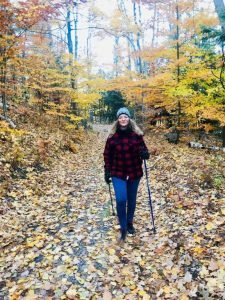 When it comes to hiking and Nordic Walking athletes destroy collapsible poles. Seniors and individuals with balance issues should NEVER be sold collapsible poles because they rattle, vibrate, don’t hold their settings, may fail unexpectedly and obviously can’t be trusted. Cheap/flimsy twist-locks, flip-locks, push buttons, and foldable poles are unsafe and they are not user-friendly. This is why our quality one-piece poles, in 32 different lengths, are the #1 recommended poles by Doctors and Physical Therapists. We are the only company in North America that tells the truth about collapsible poles. There is nothing “Nordic” about the collapsible poles flooding the market from China. Don’t get scammed by collapsible poles. Don’t be a Scrooge this Christmas – be sure the ones you love receive quality one-piece poles this Christmas.